Denzel Washington starring in a film is like having a Good Housekeeping Seal of Approval. You just know that no matter what kind of project it is, Denzel will deliver the goods. It's director Robert Zemeckis welcome return to hard drama after such films as The Polar Express, Beowulf and A Christmas Carol. Washington and Zemeckis signed on to the screenplay by John Gatin who based it on his own personal experience with substance control issues. The trailer only gives a small hint on what's in store in the whole movie. It's a hard and unflinching portrayal of a pilot who can safely fly an airplane but can't help his own life from spiralling out of control. From the first scene onward, Capt. Whip Whitaker is an airline pilot is every potential passenger's worst nightmare if they knew what he did on his down time. Obviously a functioning alcoholic, he's flying after a night of booze and coke with a couple beers and snorts before going in to work. His newbie co-pilot is worried about this captain, but Whitaker is cocky and self assured. He's good friends to the stewardesses, even having a relationship with one, and manages to put everyone at ease. Pulling the plane through some rough weather has the passenger's cheering for the Captain's expertise. Zemeckis created the most harrowing plane crash ever with the camera focused on the claustrophobic cockpit as Whitaker coolly manages to take control when a mechanical catastrophe occurs. The panicked co-pilot (Brain Geraghty) is balanced by the seasoned stewardess (Tamara Tunie) who Whitaker calls in to help with the controls. Quickly accessing the situation, Whitaker decides to “flip” the plane over to buy time to find a place to bring the plane down. It's a scene where you don't want to blink less you miss something. The fact that he manages to bring the plane down with a minimum loss of life is a wonder to the NTSB who is in charge of investigating the crash. Even when they try to duplicate the conditions using 10 different pilot simulations, all of the pilots crashed. Whitaker's old Navy buddy (Bruce Greenwood) is his union pilot rep who wants to help him avoid criminal charges. 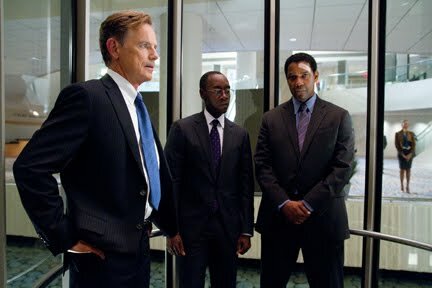 He brings in a smooth lawyer (Don Cheadle) to try and get the blood tests squashed before he has to go for a hearing. Through all this we are introduced to a recovering heroine addict Nicole (Kelly Reilly) who Whitaker meets at the hospital. He helps her out by letting her stay at his dad's country house where he's hiding from the reporters. At first Whitaker makes an attempt to stay sober, but soon enough he's back drinking and Nicole realizes she can no longer be his co-dependent. John Goodman plays Whitaker's enabler and drug source in a flashy Big Lebowski sort of way. Whitaker is not a sympathetic character and Washington embodies all the quirks and unhealthy physique of a man out of control. He's proud, confident, and believes because he saved all but 6 in an impossible situation, then all his wrongs should be wiped clean. Faced with having to pay the piper, feeds the devil inside of him. We never truly understand why Whitaker is wired that way. We know know he's broken from his wife, and his son has no respect for him. Washington takes you on Whitaker's journey of self destruction even knowing that he will lose his right to fly if he keeps crossing the line. It's a tough movie to watch, but it's Denzel. It's worth looking.